London, England-ADC's first major installation at London Luton airport involved the design, supply, and installation of PA and paging for the new walkways and gates built in the summer of 2002. At that time a TOA SX-1000 paging matrix and various branded loudspeakers were used to provide paging for the new build and also paging facilities for the entire old terminal, replacing their existing control system. All of the old paging panels were upgraded to custom ADC-designed and supplied units, and new amplifiers were installed to drive both the new loudspeakers and the older legacy system. As part of Pegasus Phase 1 at London Luton airport, ADC installed custom clusters of Community's I/O5 loudspeakers throughout busy, open areas in the terminals. The New Terminal Building's (NTB) existing voice alarm systems front-end control and amplifiers were upgraded by ADC in 2003 to a TOA VX-2000 integrated voice evacuation control system. Further VA zones were added in the NTB and new paging facilities were installed. Fiber-optic LAN based paging and control systems have also been installed throughout the airport complex and WAN based technologies also allow ADC to interrogate the control system. Digital recorded voice messaging and safety calls have been implemented in both NTB and OTB terminals and event timers are employed to replay messages at set intervals. Pegasus, started in the spring of 2005, is the ongoing project for the VA/PA systems required for the airport's ambitious expansion plans. Pegasus Phase 1 incorporated PA/VA for a new pier building and development of the first floor of the existing NTB. In total, seven new zones have been completed by ADC under Pegasus Phase 1. In the corridors and walkways, Community I/O5 on-wall and Cloud 4 ceiling loudspeakers are used as appropriate for the ceiling height and construction. 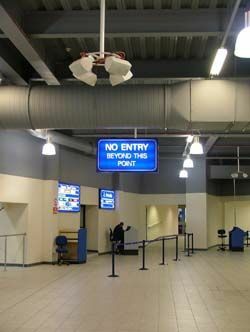 In open areas, including passport control, central search, immigration and baggage, ADC employ custom clusters of I/O5 loudspeakers. The use of Community's I/O5 in clusters works particularly well, as Lorn Money, MD of ADC explained. "When we started Pegasus Phase 1 we tested many different loudspeakers," said Money. "Eventually we chose the I/O5 for its excellent build quality, very high intelligibility and natural voice reproduction in areas of low or high ambient noise. Combining three or four in a 'catherine wheel' cluster also gave us very good coverage and even dispersion, without discernable hot spots. The results were so good it's become something of a standard for us when covering large areas with medium ceiling heights." The first floor concourse area has existed since the NTB was built, but was not previously developed. The impressive hall is now the main Duty Free retail shopping area. Due to the size and ceiling height, ADC installed five Community R5.94TX in the main shopping area and a further two R5.94TX around the seating areas at the north end. With a ceiling height of 10 meters, efficiency and tightly controlled dispersion were critical and on-site testing was necessary before the R5.94TX was chosen as the best solution. The R5.94TX uses a 12-inch cone LF driver and a co-axially mounted 1-inch exit HF compression driver coupled to a nominal 90-degree by 40-degree horn. All of the loudspeakers used at London Luton airport are modified by ADC conform to BS standards for voice alarm systems. Each loudspeaker is fitted with an in-line thermal fuse to isolate the loudspeaker from the circuit if it is burnt out, maintaining line integrity for as long as possible in the event of a fire. ADC employs full computer-based acoustic analysis of all areas when planning and deploying a system, giving them both expected and achieved SPL figures and also the audibility and intelligibility of paging calls and messages. The TOA VX-2000 voice alarm and paging control system and SX-1000 paging matrix has a battery back-up, dual processing, and also monitors all the A/B loudspeaker circuits continuously for faults. "It has been a major commitment for us and the airport, and it's important for us to have the excellent support and dedication we've had from the staff at both Community UK and TOA," Money concluded. "Pegasus Phase 1 has been our busiest period to date, but we've already started on the first two zones of Pegasus Phase 2, with a further 50 Community I/O5 adding to the 200 Community loudspeakers already installed in Phase 1."